The National Academies of Sciences on Wednesday released a climate report partly funded by the Trump administration calling for increased development of negative emissions technologies (NET) to offset carbon dioxide emissions. The report highlighted four technologies "ready for large-scale deployment" to remove carbon dioxide from the atmosphere: reforestation; changes in forest management; carbon dioxide uptake and storage by agricultural soils; and the use of biomass energy with carbon capture and sequestration. The options were rated as having a low to medium cost and "substantial potential to be safely scaled up from current deployment." The United Nations Intergovernmental Panel on Climate Change (IPCC) released a report earlier this month calling to limit global warming below 1.5°C by 2100, contrary to the Paris Climate Accord's goal of a 2°C increase limit. The international report detailed the current effects of global warming, painting a bleaker picture than the recent U.S. report. The National Academies' report prompts for an increased investment in NET development within the U.S., acknowledging the positive impact of the extended 45Q tax credit which provides an added incentive for carbon capture and storage, including direct air capture. The incentive has not sufficiently leveraged the high costs of carbon capture technology to tempt most power generators, and experts said additional policy drivers such as a carbon tax or fee would be needed to make the deal worthwhile. "This study is another important finding from top scientists showing that capturing carbon ought to be part of our strategy to avoid the worst of climate change," Sen. Sheldon Whitehouse, D-R.I., told Utility Dive via email. "That consensus is why I've been working with members of both parties, including senators from fossil fuel-producing states, to find ways to remove carbon from our air and diminish the climate threat," he said, referencing 45Q efforts. Whitehouse pointed to a provision in the Farm Bill, saying Congress is "close to passing legislation to help find ways to harness ocean ecosystems to capture carbon." In addition to prompting a policy push, the recent climate studies have led to a funding push. Y Combinator, the startup funder responsible for getting over 1,900 companies going including AirBnB, Reddit and Dropbox, issued a request for startups and nonprofits on Tuesday for innovative carbon removal technologies pressing "on the limit of what's possible." The company is looking to fund between five and 20 companies to have "a reasonable chance of success," YC President Sam Altman told Axios. YC initially provides $150,000 to startups for a 7% equity stake, with the option of additional financing. YC requested proposals regarding projects for genetically engineering ocean phytoplankton, using electro-geo chemistry to remove carbon dioxide, cell free enzyme systems for carbon fixation and desert flooding to productively use uninhabited land to grow phytoplankton. "While these approaches are not our Plan A, we think it's time to get Plan B ready," YC wrote on its website. The U.N. began including NET in its annual emissions gap reports in 2017. 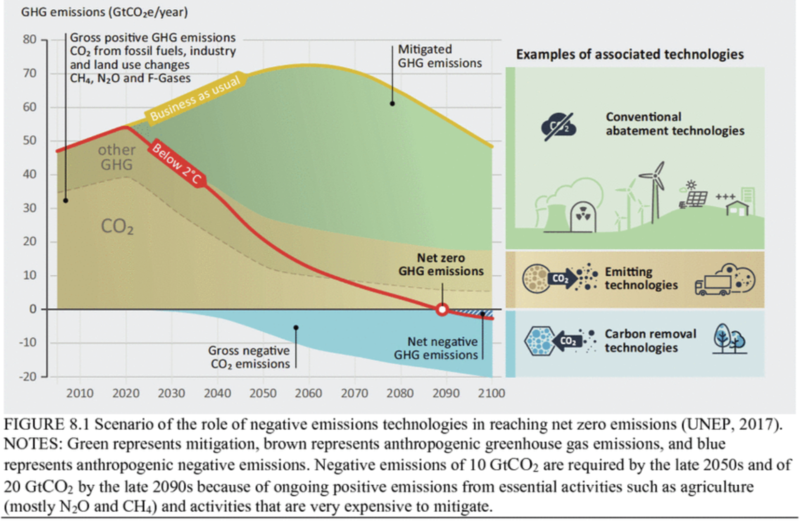 The group identified the need to remove emissions instead of solely abating them with emissions-free technology in order to meet the 2°C Paris Climate Accord goal. "Energy efficiency in industry is more economically feasible and an enabler of industrial system transitions but would have to be complemented with Greenhouse Gas (GHG)-neutral processes or Carbon Dioxide Removal (CDR) to make energy-intensive industry consistent with 1.5°C (high confidence)," the IPCC noted in its technical summary. The electrification, carbon dioxide capture and fuel substitution methods that would lead to "deep emissions reductions required in energy-intensive industry to limit warming to 1.5°C" is being "limited by institutional, economic and technical constraints," IPCC wrote.